Google AdWords is Pay-per-click marketing. You set the budget and a per-click fee is deducted every time a prospect clicks through to your website. 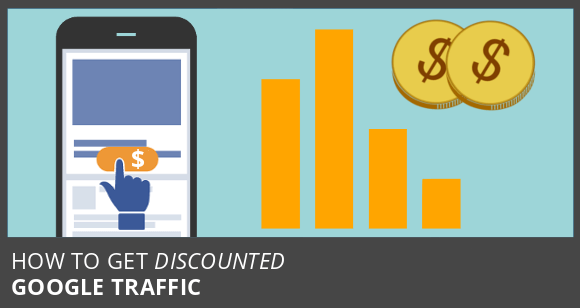 In this blog post I breakdown Cost-Per-Click and explain how to get discounted traffic from Google. Cost-per-click (CPC) is the price you pay for each click in your Google AdWords campaign. CPC is calculated instantly every time a search term triggers your ad. Max bid is the maximum price you (the advertiser) pay-per-click on any given keyword. You never pay more than your Max Bid, and often pay less. Max Bid is an expression of “supply and demand”. Therefore, Google advertising is controlled by supply and demand. Let’s say you and your competition make good returns from your Google Advertising. Then, a new advertiser enters the auction. If they are going to appear on page #1, then they need to rank above one of the existing advertisers. Google calls ad position “Ad Rank”. When your Ad Rank is higher than another advertiser, your ad appears above theirs in the search results. The new advertiser sets their Max Bid price. They set their Max Bid based on the Ad Rank required to appear on the first page. When they launch their campaign, their ad pushes the lowest Ad Rank advertiser down and on to page two. If the relegated advertiser wishes to regain their first page position, they must increase their Ad Rank. Which, the most common way to achieve this is by increasing their Max Bid. Eventually, cost-per-click increases beyond the point where some advertisers can make an acceptable profit. This leads to some advertisers dropping out of the auction. Leaving fewer advertisers competing for traffic. Demand for first page ranking drops, and cost-per-click becomes stable. This process is the same in every competitive market. Cost-per-click is determined by what advertisers are willing to pay. So you see, it is the market, and not Google, that determines price. Now, there is another component of price. “Quality Score” is a marketer’s secret weapon when it comes to Google advertising. Now, I could talk in-depth about the mechanisms that contribute to Quality Score. And I will talk more about this topic in future articles. But for now, it’s important that you understand the driving force behind Quality Score. You see, Quality Score is really about one thing, profit! And it’s quite ingenious how it works. You see, there are two mechanisms by which Quality Score increases Google’s profits. Firstly, Quality Score maintains the quality and integrity of Google’s paid ads. Google calls this “user experience”. If a user does a search, then clicks on a paid ad only to find out that the website has nothing to do with what they are looking for… well this gives them a bad user experience. If a user has too many bad experiences with Google Ads, then it trains them to stop clicking on the ads (Google’s main source of revenue). Or worse still, stop using Google and find a better-quality search engine. And Google really doesn’t want that. Whereas, if they have a positive user experience… if the ad is relevant to the keyword, and landing page is relevant to the text ad… then the user is going to continue clicking on those Google ads. And Google will continue to grow their ad revenue. And maintain their dominance as the number #1 search engine. So, user experience is very important. If you focus on user experience, then you’ll gain high Quality Score. Which in turn, helps to reduce cost-per-click. Okay second, Google encourages advertisers to run efficient campaigns. Click-through-rate is the primary way Google measures text ad performance. CTR is the percentage of prospects that search, and then click-through to the website. Now, CTR is important to Google because, Ads with high CTR get more clicks and earn more ad revenue than low CTR. For example, let’s say the keyword “Dentist” gets 100k searches per month, and costs an average of $2 per click. If text advertiser ‘A’ has a click-through-rate of 1%, then they will get 1000 clicks at a total spend of $2,000. Therefore, Google earns $2,000 in ad revenue. Now, advertiser ‘B’ has a click-through-rate of 5%. So, the same keyword will generate advertiser ‘B’ 5,000 clicks with a total spend of $10,000. Google earns five times more ad revenue from advertiser ‘B’. Google use some of that extra ad revenue as an incentive. You see, CTR is a major component of Quality Score. When CTR is high it boosts Quality Score. Which again, helps to reduce cost-per-click. That’s a brief description of click-through-rate and how it impacts price. We’ve seen as much as 50% discount off the cost-per-click just with increased click-through-rate. So you definitely want to optimise you ads and work on improving Quality Score.